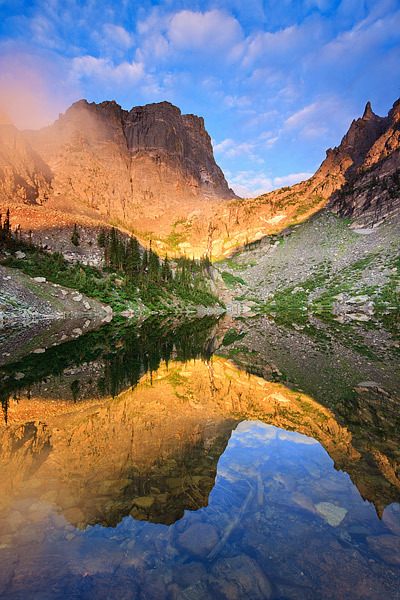 Fog hangs in the saddle below Hallet Peak as the sunrise briefly illuminates Emerald Lake. It had been raining in Rocky Mountain National Park for the last two days, but the sun made a short but spectacular appearance this morning at Emerald Lake. Not only were the clouds and fog perfect on Emerald Lake, but there was no wind giving me a rare chance to photograph this location with a perfect reflection. Photo © copyright by Thomas Mangan.